Senior US government figures including Hillary Clinton and Joe Biden have called for WikiLeaks to be registered as a terrorist organization and founder Julian Assange to be considered a “high-tech” terrorist, while government strategists and military top brass have called for his assassination. The US periodically confirms that a criminal national security investigation into Julian Assange and WikiLeaks is ongoing — for example to a US court on 4 March 2015, and to theWashington Post on 28 January 2015. 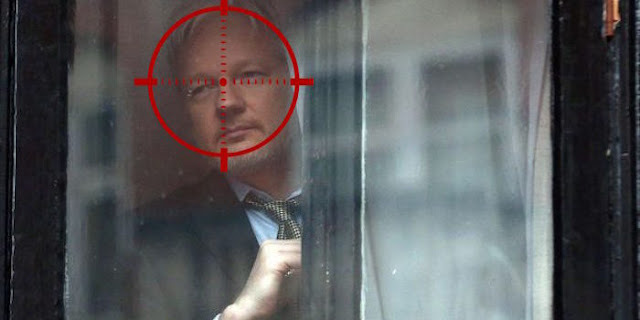 However the violent rhetoric used against Assange by senior government officials from both sides of the political divide confirm that exposing corruption within the US ruling class will lead to being labelled a terrorist. This is so the government can stop the flow of real information to the people and continue with their program of mainstream media collusion and disinformation. Has there ever been a more chilling real world demonstration of Orwell’s line? “A dead man can’t leak stuff,” he said. We live in a world where exposing government corruption is considered a crime punishable by death, while the exposed corrupt politicians are given a free pass. This state of affairs suggests the government are not serving the people, but are serving the interests of an elite ruling class. Last month, WikiLeaks released nearly 20,000 emails that appeared to show the committee favoring Hillary Clinton over insurgent challenger Bernie Sanders and controlling mainstream media during the primary season. The disclosure led to the resignation of DNC Chairwoman Debbie Wasserman Schultz and several other senior officials. Assange has promised that more DNC leaks are forthcoming.